It is important to remember that Provence is foremost a country of rosé wines, and this is not the region we think first when looking for a good red wine, except for Bandol of course, and even Bandol where you’d have found 70 % of reds years ago now make a majority of rosé. This is a broad-brush picture and you certainly will find good reds after spending some time, but figures speak by themselves : in Provence, 90 % of the wine is rosé, and often early-drinking rosé, this is a big share indeed and we can’t but think to the potential to make great reds in this region, like a few producers showed us, I think for example to Jean-Christophe Comor who could make his delicious reds from unsuspected vineyards in the back country of the Var département. We come at it today as I heard about a fairly recent domaine in the same region which was set up precisely with a focus on quality reds. I first heard about the Bergerie d’Aquino a couple years ago from a friend who lives in the area and told me about a small domaine making long-élevage red cuvées that were selling by the way at prices well above the norm of the region. We had tried at the time to visit the domaine but it was located along a remote road between Saint Maximin and Mazaugues and we never found the gate, having probably taken the wrong stretch of the road. This year B. And I had the opportunity to taste the wines of this small domaine while visiting the Maison des Vins des Coteaux Varois in La Celle, a place where you can taste for free dozens of wines of the region (and buy bottles too). Both the rosé and the red were gorgeous, if indeed priced accordingly. So we decided to try again visit the domaine, and this time I found the phone number of the domaine and left a message to tell about our visit. The Bergerie d’Aquino happens to have recently changed hands and I was called back by the new owner Eric Bompard who was about to leave for Paris and had a visit organized for us with the domaine’s enologist Emmanuel Gaujal, a man with a long experience in the region's wine development. To give you a better picture, the domaine is located 35 km from the Mediterranean (as the crow flies) on a wooded plateau with very little construction, the winding road is a beauty across Provence scents and garrigue, this is an area for sheep and goats (I wrote this goat story near there). The 75-hectare property had initially some 7 hectares of vineyards plus in its midst, ruins of what were long time ago a sheepfold and a farm (bastide). The vineyards were still taken care of but no one lived on the premises, and around 2000 this property was up for sale, and it was spotted by an American named Thomas Bove, an Indiana native who for years has been very active in the wine sector of this region and owned several domaines there. To get a better picture of Tom Bove’s flair, he is the one who spotted and bought Chateau Miraval, a huge property located north of Correns (now a fully-organic village) with some 2OO hectares of woods and garrigue and 30 hectares of vineyard. At the time Tom Bove modernized the facility of Miraval, with the help of enologist Emmanuel Gaujal who had been working for Miraval since the 1970s’. 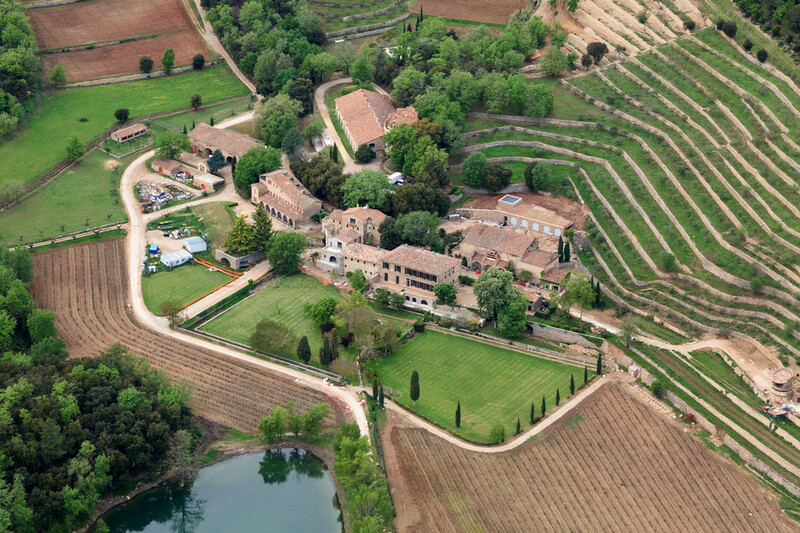 Miraval (actually the large bastide and its side buildings, the whole having the size of a small village) was then rented in 2008 to two famous Americans who fell in love with the property, Brad Pitt and Angelina Jolie, and they bought it 3 years later. It seems that Tom Bove later also fell in love with this smaller property with its vineyards, its ruins and old oak trees, and he gave it the name of Bergerie d’Aquino, in reference to Thomas d’Aquin (Thomas Aquinas) who passed on the Roman road near there en route to Lyons and may have stopped for the night in this traveller’s stopover. The Via Aurelia, one of the 1st major highways of History was built by the Romans beginning in 241 A.D. and it passed near here in the vicinity of Tourves. When Tom Bove bought this property in 2000 his goal was to make high-quality reds. He had other domaines where he was producing already lots of rosé and here he wanted to kind of specialize with reds here instead. He was helped along again by enologist Emmanuel Gaujal who was put to task for the vineyard management and the vinification for the Bergerie d’Aquino. The vineyards were planted with old vines of Mourvèdre, Syrah, Grenache. Mr Gaujal says that certain terroirs on the property are very valuable, with poor, stony soils. Another important thing is that the harvest here in the area is much later (end of september) compared to other mainstream areas of this part of Provence, because the nights are cool and there's a wind corridor in this area, and this micro climate is also a good point to make great reds. The first vintage was 2003 and as there was no standing building, no facility whatsover on the property, the grapes were trucked and vinified a few kilometers away in another domaine owned by Tom Bove north of Brignoles. Tom Bove managed the Bergerie d’Aquino as a domaine from 2003 to 2008 and then he sold the property with vineyards (then still without standing building or facility) to a Belgian investor who loved wine, who wanted to keep the domaine active but also had the dream to resurrect the ruins and build anew the bastide and a winery facility as well. Emmanuel Gaujal was here also the common link with the wine/vineyards part of the property, and he gave his concept on how to ideally organize and display the new chai and facility. He wanted to avoid the typical “cathedral-high” chai and he limited the height to just above the tallest vat. He says it’s important to limit airstreams in a vatroom and he prefers to have a confined environment. The whole structure is made of wood and is well insulated. From the vintage 2009 the wines of the Bergerie d’Aquino were thus vinified on the property, near the newly-rebuilt farm, which seems to have always been there intact for ages, facing the couple of very old oak trees that I think might be 200 years old or even more. The new Belgian owners decided to also make rosé and white, and not only reds, and so they had some more parcels planted in that regard, the vineyard surface reaching now 9 hectares. Then lastly, the domaine changed hands again, but this time it was fully operational with its own facility and a perfectly habitable bastide. The vinification room or chai is rather compact, with some working room in the front to move around, a line of tall stainless-stell vats on the right and several white-and-blue cement vats in the bottom (5 of them if I remember), these cement vats having been chosen with this initial focus to vinify exclusively quality reds, Emmanuel Gaujal wanted to use cement fermenters because they do a particularly good job for the vinification of the reds. These tanks are made in Italy by Nico Velo, they've been prefabricated meaning that they were shipped here in parts and assembled on the spot. Italy is indeed a pioneer in cement containers. Mr Gaujal says that the temperature inertia is very good in cement, plus the bottom of the chai is half interred because the building is backed to a slope, so the room and particularly the cement vats remain cool and stable. The stainless-steel vats are used for the rosé and white, as now the domaine makes 10 % white and 20 % rosé, and the total output is 30 000 bottles. The stainless-steel vats are also Italian made, by Fracchiola, they may look like 3 tall vats but you have here 12 vats because each unit comprises 4 independant vats, the upper one having a floating lid so that the volume can be adapted. A stairwell and gallery helps access to this upper level. The rosé and white get a short élevage while the red gets a longer one, first in the barrels, then in bottles. Mr Gaujal says that the red 2007 that we tasted at the tasting room of La Celle was put on the market 18 months ago. The vatroom has also been designed with gravity in mind, and the grapes arrive in the chai from the upper level, above the cement vats. With the slope behind the building, the grapes can be poured straight into the upper openings of the cement vats, after going through the vibrating sorting tables and crushing machine. On this picture we're standing atop the cement fermenters and you can see on the lower/right the opening of one of these vats. The red grapes are destemmed and crushed, then have their fermentation in the cement vats with pumping over twice a day. The grapes for the white and rosé are just crushed and then pressed downstairs in the pneumatic press and have their fermentation in the stainless-steel vats. Asked if they use indigenous yeast for the fermentation, Mr Gaujal says that the process has changed compared to the early years of the domaine, when the vineyard management was organic. With the difficulty to plow certain parcels because of the big rocks and stones that could break the tools, they dropped down the practice, and from what I understand used herbicide instead. The bottle storage is located along the vat room, it looks even colder. They have the bottlings done by a service company. Speaking about the cuvées of the domaine, Mr Gaujal says that there are 2 cuvées, the cuvée Etoiles d’Aquino which is the basic cuvée and is made in red, rosé and white, and the other cuvée is the star cuvée of the domaine, the Bergerie d’Aquino. The Etoiles red is made with Syrah and Cabernet while the Bergerie is a blend of Mourvèdre, Syrah and Grenache. The barrel cellar is located on the basement of the house, and you reach it through a door on the front of the bastide (pic on left) that has been rebuilt in the place of the ruins, it's by the way impressive how this house seems to have been standing there forever, even the rare windows have been reproduced with the typical small size of the past, when people tried to limit the penetration of the outside heat. This surface is thus relatively fresh; it holds about 20 barrels exclusively for the high-end cuvée of red, the domaine making now three basic cuvées with a shorter élevage which takes place in steel vats, a red, a rosé and a white. For the barrels they use only new casks, I ask if they sell the barrels afterwards but I’m surprised to hear Mr Gaujal say it’s unsaleable, the reason being that the buyer can never know with a second-hand barrel if it’s sound and healthy. The barrel cellar is also where visitors taste bottled wines, here an Australian family who was staying in the region for vacation found the domaine by chance while cruising on this side road. __ We tasted the three colors of the basic cuvée (Etoiles d'Aquino), here the rosé which is an opulent, complex rosé fit for gastronomy but also very pleasant and fruity for an apéritif. 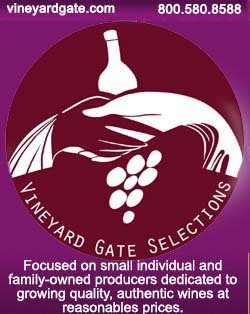 We had already enjoyed it quietly at home after having bought a bottle at the Maison des Vins des Coteaux Varois in La Celle. This rosé is well above the crowd of rosés you find in the shops and costs 8.4 € at the domaine (the Maison des Vins sells it for 9.7 € if I remember). This rosé is made with Syrah and a bit of Grenache. They planted Cinsault this year but they'll begin to have fruit 4 years from now. This is a complex rosé. Mr Gaujal says that in the region people use also syrah to make rosé but in a proportion much smaller in the blend, around 20 or 30 %, when here it's 80 %. The issue with Syrah is that it gives color very quickly and you have to be careful not to extract color, especially when it's a 80 % share. In order to keep a light color the maceration is very short, and it's done very early in the morning, when it's still cool. The yields on the domaine are 30 hectoliters/hectare and the vines are old on average, 50 years. __ Etoiles d'Aquino red 2010. The entry cuvée of red, a blend of Syrah/Cabernet Sauvignon, no barrel aging here. THe vatting is shorter here compared to the high-end red, 10 days instead of 30, which yields a supple wine easy to drink early. In the mouth the substance is pleasant, I almost thought it wasn't filtered but they filter everything here. The wines makes 14 % in alcohol but it passes well. The Bergerie d’Aquino red (here the 2007) is a deep, complex red, from what I remember when we tasted it at the Maison des Vins des Coteaux Varois (we didn’t taste the wine again here). It is a wine with suave nuances of black fruits. Don't pay attention to the label which like me you may not like, the wine is worth a try. This is a majestic wine that certainly gets very well along food and meat, but it was a pleasure by itself already. A bottle at the domaine costs 25 €, making it a relatively-expensive red when you compare with the norm in the region, but roughly in the average of mainstream quality reds made in the Var, I think for example to the wines of Peyrassol or the ones of Rimauresq. On these pages you can see on the other hand that Aquino's rosé is a very good deal in terms of price for a quality pink. I asked Mr Gaujal if they filter the wine, he said yes. Because of the long élevage I had presumed he wouldn’t. The wine is filtered, and with grids (plate filtration). The glass bottle is of a very nice design and it’s quite heavy in the hand. They target the quality restaurants of the region for this cuvée. B. noticed that all the casks are made by François Frères, and Mr Gaujal says that when he first met and bought his barrels it was still a small Burgundy cooperage back in the 70s' and he remained loyal because of the quality of the product. Asked why he doesn't keep the barrels for more than one wine, he says that everything a barrel can give, it gives it in the first 18 months, after that he has to get new ones for the following vintage. He asks the cooperage for medium toasting for his barrels. For this high-end cuvée they still sell the 2004, 2005, 2007, the 2006 has been bottled recently and will soon also go for sale. Wild boars are a big problem in the region, the situation is even worse than in the rest of France in regard to the damaged crops and fruit. The whole surface of the parcels is now protected with electric fences which are partly paid by the hunting organizations (like in other French regions with rampaging wild animals) but the workforce costs remain at the charge of the domaines. Emmanuel Gaujalm says that the population growth of the wild boars has gone totally out of control over the last 20 years and this is a nuisance for the growers, especially I guess in areas completely surrounded by kilometers of wilderness like here. The wild boars now descend routinely from the hills into the outskirts of the villages in search of food and roots to rampage in gardens. When you hear dogs barking in unisson beginning around 10:30 at night in summer, you’re pretty sure that wild boars are around going through yet-unfenced properties, heading to gardens and crops , and I can testify myself on the problem, having just a few days ago chased them and throwed stones at them after having heard them foraging the ground near the house where I stayed. I must recognize there’s a particular thrill when you go after a group of wild boars in the dark holding a torch and trying to voice threateningly so as to contain your own fear, I love that. You throw a few stones while walking agressively in their direction and you hear distinctly the characteristic groaning of the animals as they scatter back to the hills, but you never know how many they are exactly, and if there’s a mother with its piglets (supposed to be more dangerous)... A couple of times this year again we heard a gun shot in the far, in the evening, and I’m pretty sure that it was a homeowner who took the matter into his own hands even though the hunting season was not open yet. Correction : I just found this official document stating that the hunting season was opened earlier this year for wild boars, hinting that the authorities were aware something had to be done. But I don't think it will be enough, wild boars should be hunted year around for a few consecutive years to bring back their numbers at a levels the wilderness resources can sustain. And homeowners whose garden/property is being invaded by wild boars should be allowed to shoot them or trap them too, which isn't the case today I think. We had a look at the vineyards from the dirt road with Mr Gaujal (the electric fence was active). He says that while he has his say for the vineyard management, there's a permanent vineyard worker in the domaine who is in charge of doing the job. There are sprayings in case of disease pressure, it depends of the year. This year (2015) until now there's no such issue because the weather is very dry, even on Provence norms. For the weeds, there are some parcels which they can plow, and with the heavy rainfall until april they did it repeatedly. They didn't put any compost this year but they will do for the next season, they use a manure-based compost which you can buy ready to use. The picture above shows a parcel made of 2 hectares of syrah which was planted in a place covered before with both a field and trees. The soil here is very rocky and arid, the trees have been uprooted and the terrain remodeled at the time of Tom Bove's ownership and this is a good terroir to plant syrah and red varieties. They took out hundreds of tons of rocks and stones [possibly the ones now found on the wall along the road] but the surface remains very stony. Beyond the syrah, on the far left, there's also one hectare of Cabernet Sauvignon. This planting was thought with the high-end red in view. The long wall along the parcel of syrah and cabernet sauvignon has been rebuilt recently, and I don't know if this is a typical design in Provence but there are in-built steps (protuding flat stones) that allow to climb over it. I remember having seen this on terraced parcels in Auvergne (you can see one on this video __ fast forward to min 2:43__ featuring the steep parcels of Mito Inoue, the Japanese winegrower settled in the Auvergne mountains. The Bergerie d'Aquino seems to have well-maintained walls and I like that because these low walls are often crumbling and falling apart in Provence, blame it on neglect and rampaging wild-boar hoards; they were built along the centuries by local farmers using the stones surfacing in the fields and terraces and they're part of the heritage and the landscape. The parcels of the domaine (now totaling 9 hectares) are all located within the 75 hectares of the property, which is manly covered with thick Provence woods. When you leave the side road (D64) and pass the gate, you drive on the very long dirt road going up to the farm and facility, passing the different parcels on the right and left of the road, it's all self-contained and they can bring the grapes to the chai without using a paved road. The soil all over is deep clay/limestone soil, sometimes more stonny, sometimes less. Here (picture above) on a soil that is less stony you have a parcel of Grenache which is used mostly for the rosé, and the recently-planted parcel on the left is Cinsault, the grapers of which will be used in another 3 years from now. None of the parcels on the property are irrigated, I think it's important to note it because I spotted a few vineyards elsewhere in Provence with a permanent irrigation system, and this, although the weather is far from being unbearably dry for a vine (I'll post a picture on a "Wine News" story). The region, while punishingly dry in summer, enjoys important rainfalls in the colder seasons and its underground water table is well supplied. Further on the right (out of the frame) there another parcel, planted 5 years ago, this is Rolle, deemed for the white cuvée of course.